I love doing things I’ve never done before and this was my first shot at paper piecing. Its a cool quilt technique where you use a paper pattern to sew each piece to the paper and then tear the paper off when its done. 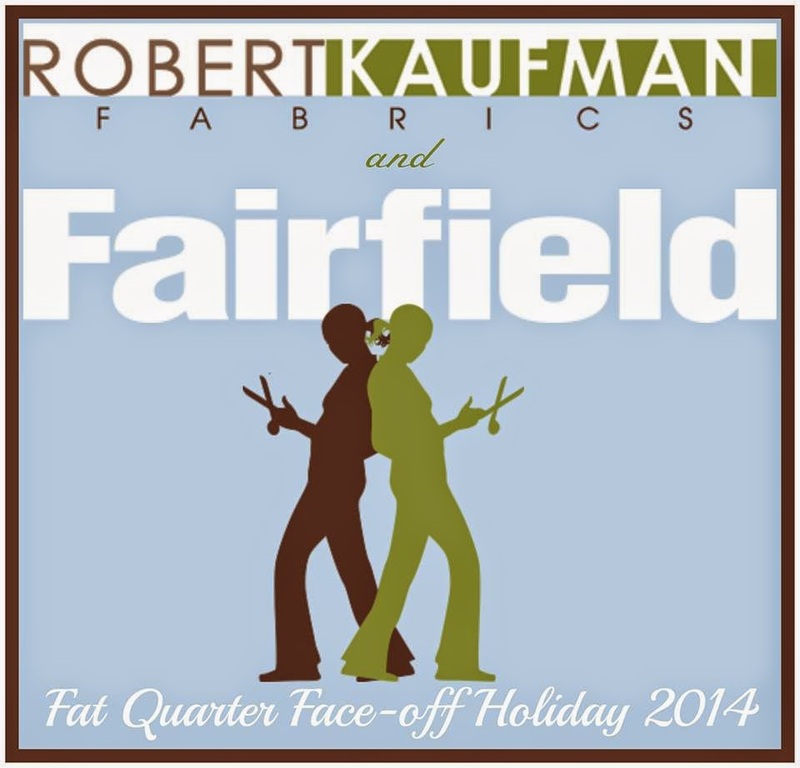 I am in a competition with Robert Kaufman fabrics and Fairfield world called the fat quarter face-off! I was sent a holiday fat quarter bundle and asked to make something with it, along with the other Master Maker designers. 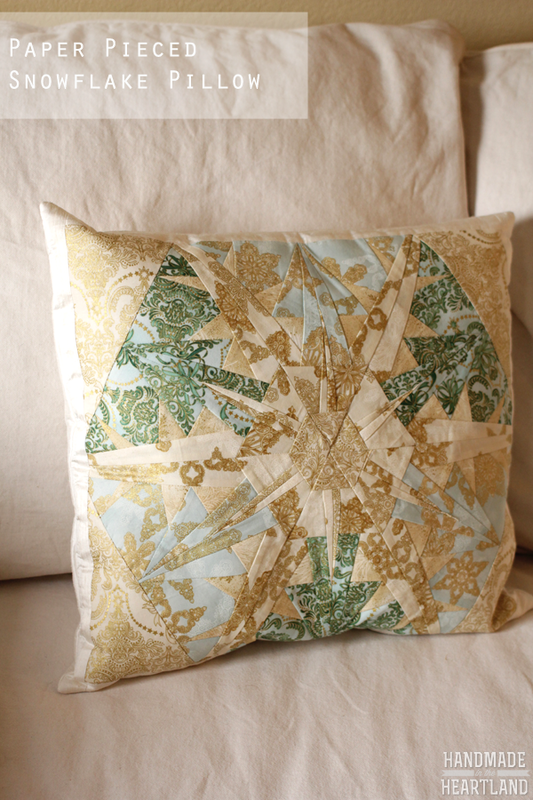 It was so fun experimenting with a new technique and coming up with this gorgeous snowflake pillow! 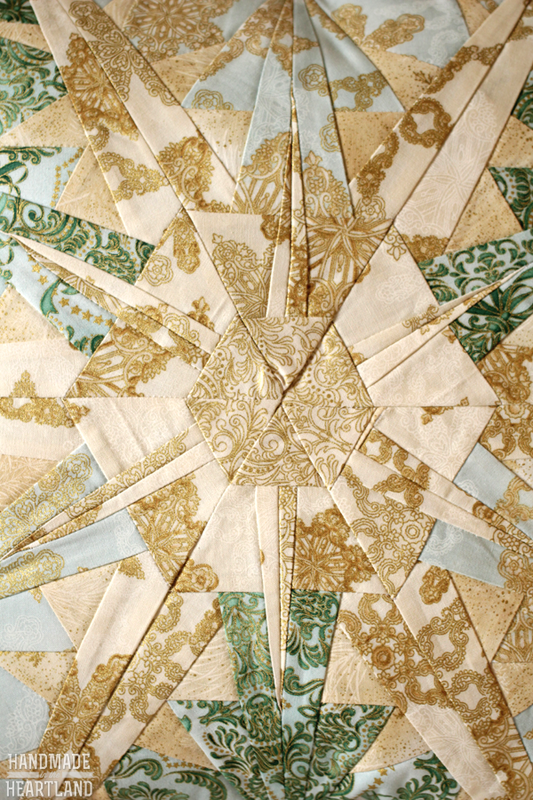 I purchased THIS paper piecing pattern from Etsy and watched THIS youtube video for explanation on how to paper piece. Like I mentioned I had never paper pieced before, I honestly had NO idea how to do it, but I new it would be beautiful with the fabric I was given. After watching that youtube video I felt pretty confident I could give it a shot and I was pleasantly surprised how much easier it is to do than the finished product looks. Seriously its really not that hard and the results are just gorgeous! After completing the hexagon pattern like you see above I cut out triangles to make it a square/rectangle that I could then turn into a pillow. 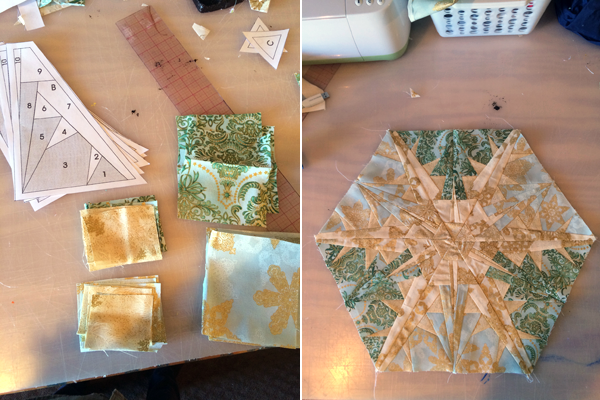 Then I used a cream raw silk (because I had it in my fabric collection and didn’t want to go to the store) and cut 2″ strips to sew around my snowflake, After that I measured the finished rectangle and cut a backing piece the same size. Because my finished product was going to be a pillow I decided to use a new fusible interfacing that Fairfield World created called “smooth” its thick and soft, you iron it on to the back of the pieces and it makes it thicker and softer. I loved the feel of the fabric after I fused it. After fusing both pieces I sewed them together (right sides together) leaving about a 4″ opening at once side to pull it right side out. After pulling it right side out I filled it with poly-fil and hand sewed the opening closed. Usually when I make pillows I use a zipper and a pillow form but since this pillow wasn’t a standard size and I knew it wouldn’t be washed (its going as a gift to a house without children and pets) I felt confident that filling it with poly-fil was just fine. Do you decorate for Christmas? 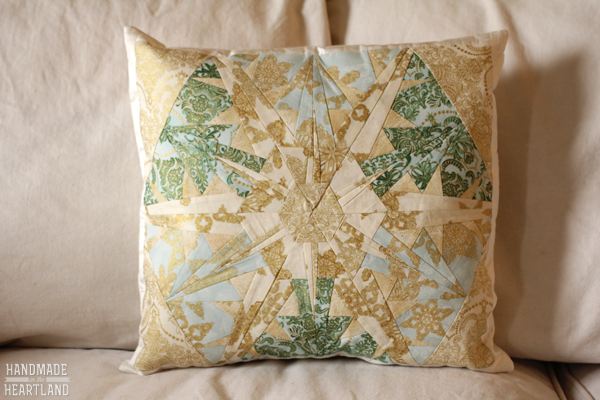 I love these non-traditional colors and I’m so excited to give this pillow as a gift this Christmas. 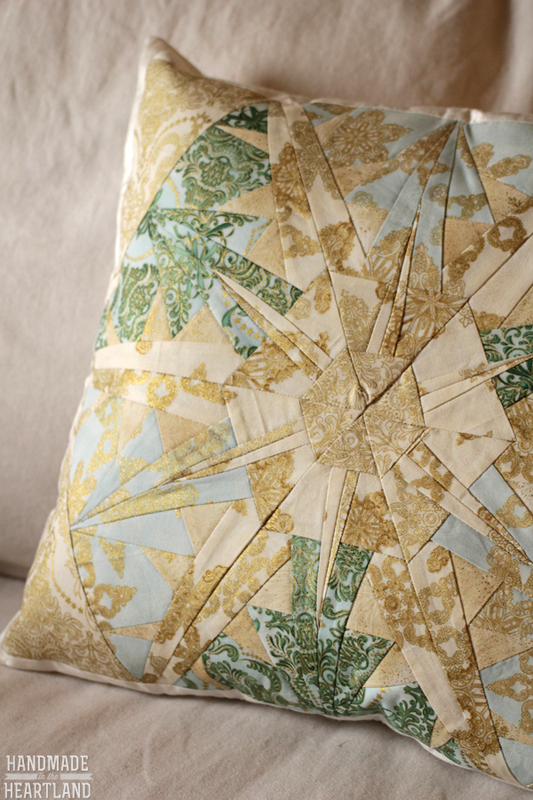 These fabrics came from the Holiday Flourish fat quarter bundle by Robert Kaufman Fabrics. YOU can win a fat quarter bundle! 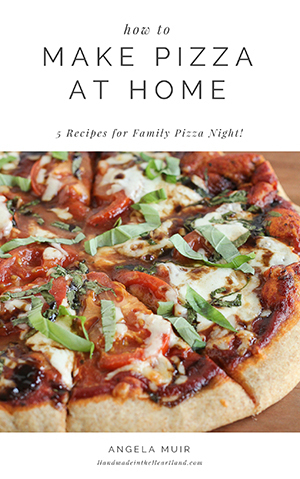 Just visit THIS post on Fairfield World’s blog and leave a comment saying what you would make with it. And last but not least please help me win the fat-quarter face-off by voting for the snowflake pillow below. Thanks friends!